Throughout the summer, student survivors of the Parkland school shooting traveled across the country to get young people registered and motivated to vote -- political action groups like NextGen are doing the same. 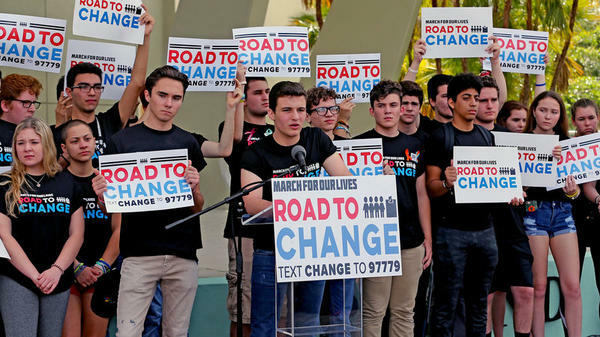 But will the efforts lead to a surge in Florida’s youth vote? We asked Jim Saunders, executive editor for the News Service of Florida, who has covered state government and politics for the last 20 years. Listen below for an interview of Saunders by WLRN's Christine DiMattei. You can also read some highlights of the conversation. We hear from News Service of Florida's Jim Saunders on what effect the youth vote this year might have on Florida's political landscape. WLRN: Historically, do young voters in the 18 to 29 age group vote in midterm elections all that much? And if so, what's typical turnout compared to older voters? Saunders: I think there's a lot of historical evidence that young voters do not vote in the same numbers as older voters during midterms and this is a real problem for Democrats. Older voters are more reliable; they also tend to be more conservative. And so when they're turning out in these midterm races, it gives an advantage to Republicans. Democrats have not won a [Florida] gubernatorial race in a midterm election since 1994. The Mason-Dixon Polling Organization came out with a poll recently about the U.S. Senate race and it showed Bill Nelson -- the incumbent Democrat -- leading Governor Scott in that race among voters age 18 to 34 by a margin of 56 to 33 percent. That's a huge margin. Now the question is whether that age group will turn out for Nelson. Even if there is a surge in the youth vote, would it be as formidable as Florida's 50-plus voting bloc? That's a great question. A lot of the new registrations are older people retiring to Florida from the Midwest or the Northeast. They're looking for some warmer weather and lower taxes. And they turn out. So the young voters may be increasing their registration but does that offset the older voters who are registering and who WILL turn out? Democrats really need to have a coalition to do well in midterms of elections. They need young voters; this year there's a lot of focus on turning out women voters. Also, African-American turnout is very important to Democrats -- and this year, too, Hispanic turnout is something that both parties are focusing on greatly. So Democrats really need to patch together various groups to counteract some of the strengths that Republicans naturally have when more conservative, older voters are registering here.